Robirohi (above), from Estonia, will travel to Northern Ireland later this month for two consecutive performances at the Old Courthouse, Main St., Markethill, Co. Armagh: on 20 and 21 January, starting at 7.45 p.m. It is not their first time in Northern Ireland. Robirohi, who have played four times at successive European World of Bluegrass Festivals in the Netherlands, made a sensation at the Appalachian & Bluegrass Music Festival at Omagh, Co. Tyrone, in 2007 with their moving and powerful harmony singing. 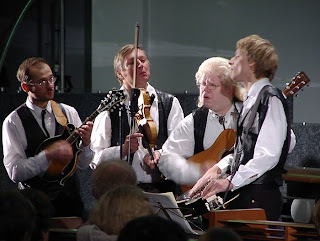 As a result, they were at once booked to return for other dates in Ulster - which they played despite the tragic death of their fiddler, Tarmo Vardja, in a road accident shortly before they were due to make the trip (see the Bluegrass Ireland Blog for 11 Dec. 2007). Tarmo's name still appears on the band's website as a member. Tommy Vance of Anchor Promotions, who is organising their Markethill shows, hopes to bring Robirohi back to Ireland later in 2011 - perhaps as early as March - with the possibility of shows in southern Ireland as well.